How to measure your dog for a raincoat? How to put on a dog raincoat? 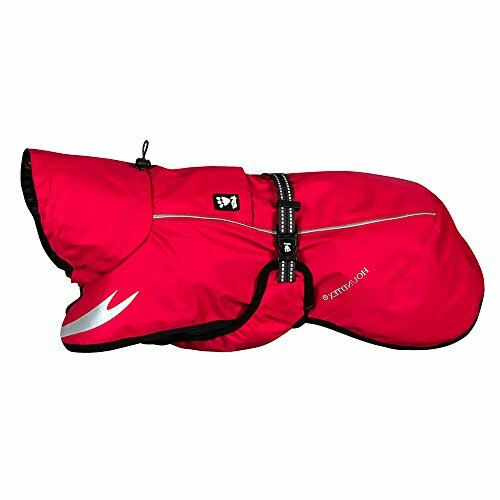 What raincoat to get for small, medium and large dogs? For anyone who has ever had a dog, you know that they somehow seem to know exactly when it’s dinner time, and when that daily walk is coming up. Even though you yourself might have lost track of time, being busy with something else, your dog is likely to remind you of that pending walk at the exact hour when you usually go out. He or she might start pacing, impatiently, and when you look up from what you are doing and look at your watch – sure enough! It’s walking time. How do they know this? Only they know. Dog walkers also like: Best Dog Boots Review. So, there you are; ready to get up, go out and please your furry friend, only to realize that it is raining heavily. This won’t be a problem if you have a dog raincoat readily available, so let’s have a look at some of the best dog raincoats available online. Don’t forget a dog backpack to carry your essentials! The RUFFWEAR raincoats for dogs are reliable options when it comes to keeping your dog dry and comfortable, and this pet raincoat is made for an adventure! It comes in sizes from XXS and all the way up to XL, so that you can take your dog out on rainy days no matter his or her size. A chihuahua? No problem! 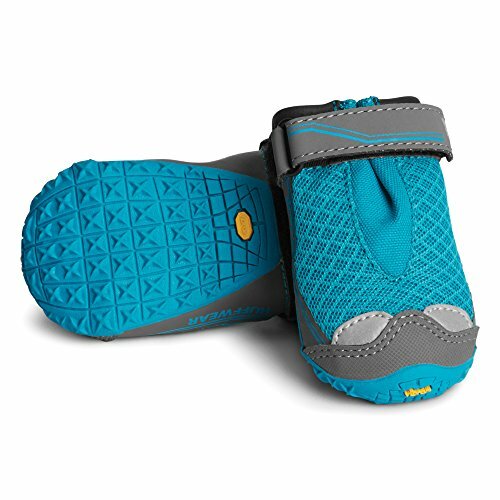 Get the XXS that is perfect for Chihuahuas, and head out even on the wettest of days. It is dog rain gear designed for the active pooch, made with the water-resistant and light-weight material, to provide maximal function and comfort. 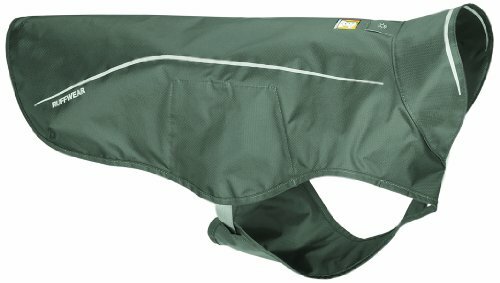 A quick-release side buckle allows for this dog pet rain jacket to be taken off and put on in a matter of seconds, and it covers the stomach area well to prevent the dog from getting too dirty on gloomy days. Save time both when putting the dogs’ winter jacket on, when taking it off and during the cleaning process afterward with this durable dog raingear. Why We Liked It – This canine raincoat isn’t only designed to protect the pup from rain coming down from above, but also from dirt and water splashing up from the ground as they walk, which makes it a lot easier to clean them up once back home after a walk in the rain. 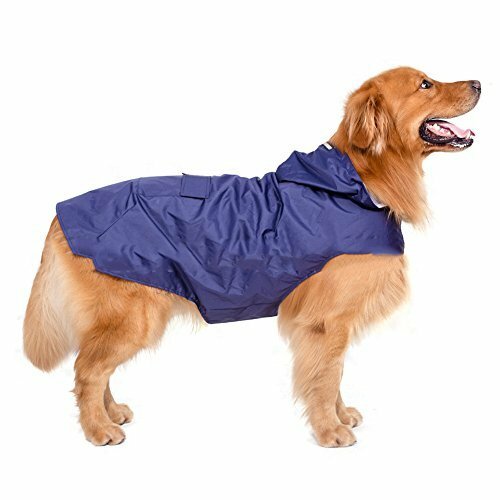 dog coats are great dog raincoats for large dogs as well as for smaller pups since they come in a big variety of sizes (and colors). This winter jacket is also an effective protection against wind, and it adjusts to dogs any shape and size with an adjustable waist-strap and a quick-release buckle on the back. Hurtta is a brand from Finland, so they know all about demanding weather conditions, and what is needed to keep your favorite dog dry, warm and comfortable no matter the weather. coat is made from rain- and wind resistant breathable materials, it is easy to wash and dry and 3M reflectors to make sure your furry family member is visible also on late-night walks or dark and rainy days. coat feels thick and durable, and it keeps your pet both warm, dry and comfortable during a walk in less favorable weather. Great to see sizes for all types of puppy dogs, and the waist-strap makes it stay in place also when running or playing. An adorable yellow dog raincoat with a double-layered design that you won’t be able to resist! 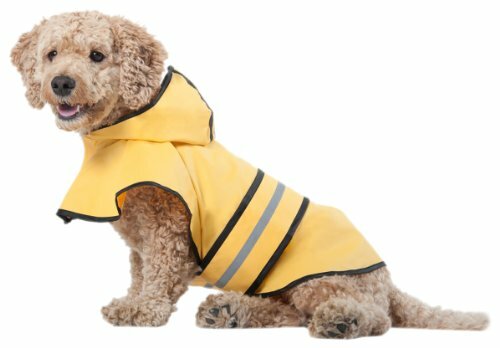 The Ellie Dog Wear waterproof dog raincoat is made with a water-resistant yellow fabric and lined with a softer material for ultimate comfort so that your dog can stay dry during a rainy walk or a trip to the dog park on a wet day, while also being comfy and cozy. The Ellie Dog Wear waterproof dog raincoat is the ultimate dog raincoat with a hood for the owner who likes to keep their pups looking sharp and stylish, without sacrificing function. There is no doubt that your pup will be the cutest one in town with one of these pet rainwear clothes, and it has practical pockets on the back for storing small items such as waste bags or a key. This dogs’ winter jacket has been tested by a third party for quality insurance, it has a zipper and a snap closure and since it covers the belly it is a great raincoat for dogs that tend to kick up a lot of dirt as they walk. Why We Liked It – While some dog owners prefer function over style, this The Ellie Dog Wear waterproof dog raincoat is the perfect option for someone who wants a waterproof raincoat that really stands out, and that will make your pup look even more adorable than he/she already is! This rain slicker for wet dogs that like to walk even when it rains is great in a way that it covers the whole body – efficiently protecting the pet from both rain and dirt. 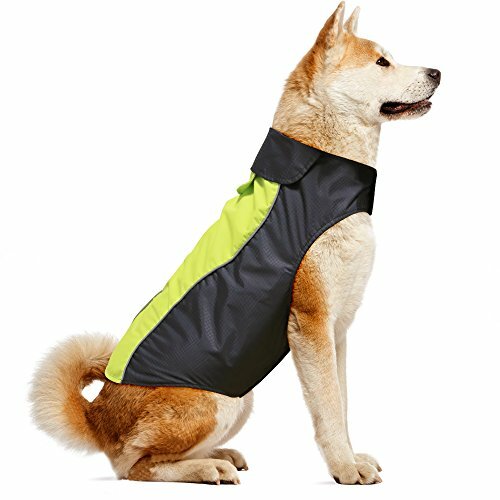 The waterproof reflective dog jacket is made from nylon materials, making it light-weight and comfortable for your pup to wear, the city slicker jacket has a convenient hole in the back for the dog’s harness or their favorite dog collar and two reflective strip accents for increased visibility at night. Small dog? No problem! Try a dog harness designed for smaller dog breeds. The material of this lightweight rain jacket is non-toxic so that you won’t have to worry about what would happen if your naughty pup would take a bite out of it at some point. The manufacturer is sure of having the best rain gear for dogs, and they offer a 60-day money back guarantee for your peace of mind. Why We Liked It – There are not a lot of waterproof rain jackets for dogs that cover the whole stomach area from water and mud being kicked up as they walk, so this pet product here stands out! It is also incredibly lightweight and comfortable for the pup to wear, which is a big plus. Elastic leg straps hold this big dog raincoat in place, and it has convenient long sides that allow for the water to just slide right off, keeping that adorable dog body underneath dry and comfortable. This waterproof dog coat has a thick reflective strip that runs across the back and around the chest area, which makes walking at night a whole lot safer both for you and your dog. Visibility is incredibly important, even more so when it rains, and this dog rainwear combines function with crucial safety features, and the 100% polyester material keeps the pup from getting wet. This reflective dog rain jacket also covers the tail, has a back pocket for small items with Velcro flap closure and this dog rain poncho comes in a variety of convenient sizes. Why We Liked It – These reflective dog coats may look like they’re a bit big for your dog at first, but the thought behind this becomes evident as soon as you go out on a rainy day. 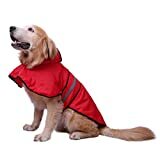 These dog jackets cover the dog completely from neck to tail, which is great for wet dogs that tend to get a bit smelly after having gotten wet. Perhaps you are one of those dog owners who won’t settle with just any raincoat for dogs in your family, but who wants dog clothes that reflect both your own personality and that of your dog(s). Buying your dogs raincoats should be fun, and why not make it a fashion statement while you are at it, with this pet dog hooded raincoat? These cute pink raincoats for dogs are easy to put on and take off with the adjustable Velcro waistband, it has reflective stripes on the back and on the convenient back pocket and another Velcro strap that goes over the dog’s chest. The lightweight shell of this pet dog hooded raincoat is water resistant and the dog rain slicker is lined with comfortable mesh material. 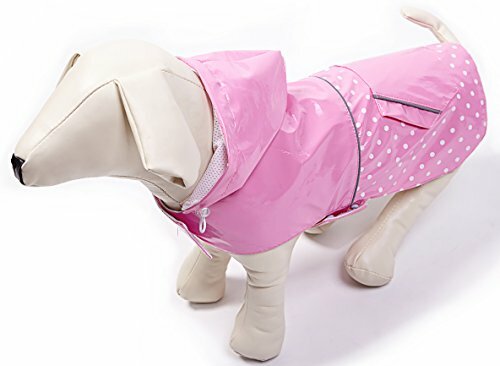 If you are not into pink – there are a select variety of other color options as well, so that you can get your pup the best small dog raincoat (or large dog raincoat, as the waterproof reflective raincoat comes in sizes up to XXXL) for dogs and owners that want to stay dry and look cute at the same time. Why We Liked It – This is a reflective raincoat for large dogs and small dogs alike, and it is great to see one of the cuter dog coats be available for big dogs as well, and not just for the smallest fur family members. Every dog deserves to look good also when it rains, and this conveniently designed pet rain hoodie coat offers the complete package of practicality and style. If you are looking for the best raincoats for dogs with a unique style – you’ve found it! 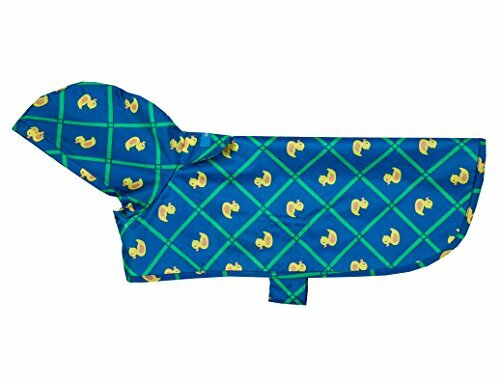 This RC Pet Products Packable dog rain jacket comes in several different presentations; each entirely different from the rest, and you can choose to get duck print, cute little anchors, butterflies, paw prints and much more. There are also solid color options for those who are on the hunt for a less cluttered design, and these incredibly charming pet dog rain coats come packed in a convenient little bag that you can easily attach to the dog leash or keep in your pocket or bag. It is very thin and lightweight and takes up virtually no space when packed into its tiny bag, which makes the RC Pet Products Packable dog rain jacket the perfect option to bring with you wherever you go so that you are always prepared if pet rain should start pouring down unexpectedly. A t-shirt or a sweater can be worn underneath for wet dogs that need a bit of extra warmth. 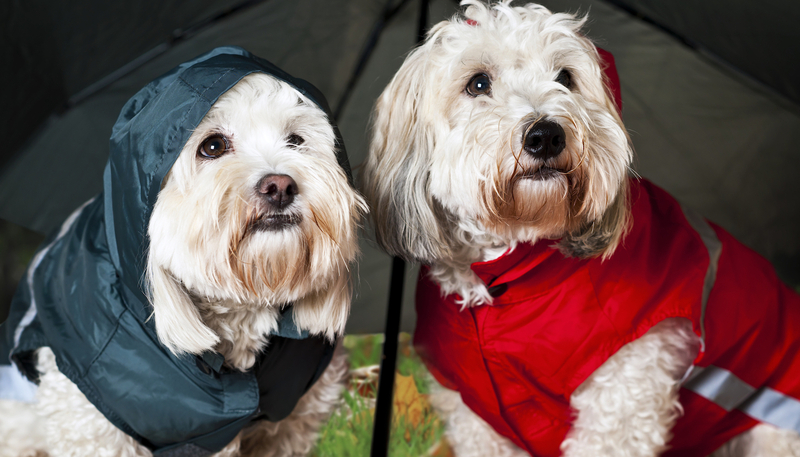 Why We Liked It – We bet you have never seen raingear for dogs looking quite like this! There are few things as adorable as dressing your dog in raincoats, and this dog apparel is an excellent option for the pet dog and owner that likes to stand out! You will definitely get your fair share of attention when brightening a gray and rainy day with these colorful waterproof dog coats for small dogs and big pups. There is something irresistible about a classic yellow doggie raincoat, and this product made from 100% quality polyester and fully waterproof coating offer both a great-looking exterior and high-functioning raincoat dogs will love to wear. The adjustable belly strap with reflecting features makes sure the waterproof dog raincoat fits the way that it should and that it stays in place so that your pup can run and play the way he or she always does, even when it rains. 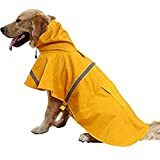 Whether you are on the hunt for a raincoat for large dogs, a medium dog raincoat or if you are hoping to find the best small dog raincoats – this Fashion Pet Rainy Days Slicker yellow jacket could be what you need. It comes in sizes to fit dogs all sizes, so just make sure you measure your pup properly before ordering, to avoid having to send it back. 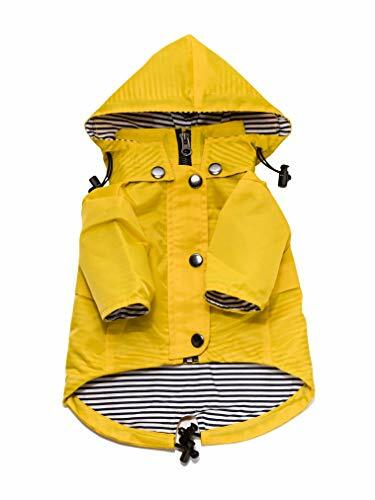 Why We Liked It – The Fashion Pet Rainy Days Slicker yellow pet rain coat for doggy family members is a classic that never goes out of style! Combine that with practical functions like the fully adjustable belly strap and you get rainwear for dogs that are impossible not to adore. The nylon waterproof fabric used to make this large reflective dog rain jacket makes sure that your pup stays dry no matter how hard it rains. Big dogs need exercise, and many don’t care at all if it looks like the sky is coming down, and this waterproof jacket is designed to cater to the needs of these furry individuals. Don’t let a bit of rain stop you from giving your furry big guys at home the physical activation they need and let these hooded heavy-duty dog raincoats do their thing by keeping your dog dry and comfortable during walks on rainy days. This waterproof reflective raincoat for dogs is highly adjustable thanks to pasting buttons, and it has reflective strip features to ensure visibility also at night. Why We Liked It – This reflective rain jacket for dogs is made especially for bigger fur buds, and we like that it is 100% waterproof so that it can stand up to heavy rain even during long walks. This hooded waterproof raincoat is one of the best dog rain jackets for bigger dogs, and with one of these, there is no longer an excuse for staying out on gray days! If you want to protect your pup a little extra from the rain, you might want to consider these resilient high-performance boots. They are breathable and allow air to come in while keeping water and dirt out. They are great for preventing rashes caused by moist, and for protecting your pup’s paws from sharp objects that might float around in the water. While some dogs don’t mind a walk in the rain, there are others who absolutely hate it, despite wearing a comfy raincoat or some form of waterproof dog apparel. 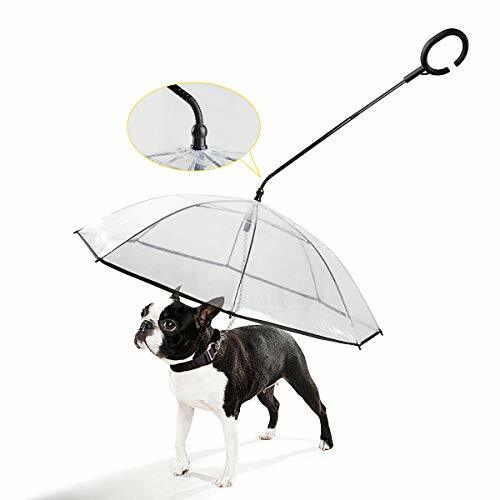 Perhaps it’s the sensation of having rainfall on their heads, or perhaps it’s just uncomfortable, and then a Pet Umbrella could be the perfect solution! It is designed so that you can hold on to it, and a chain leash connects your pet to it on the other end. Your sweet little pooch won’t ever have to get wet again and can come out and do their needs even on wet days. 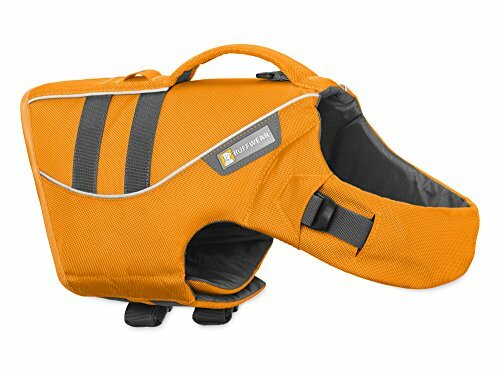 If it is already raining and your pup is bound to get wet anyway; why not take it a step further and go swimming with this stylish life jacket for dogs? It has a helpful handle on the back that allows you to guide your pet dog through the water masses, and it will keep him or her afloat and make any swimming experience a lot more enjoyable. Let’s face it; it is impossible to avoid going out in the rain when you have a dog because every pet dog – regardless of how they feel about getting wet – need to get outside to pee. Some dogs are okay with rain, others are not, but we dare guarantee that it will get a whole lot easier for everyone with a proper raincoat for dogs in the family. Keeping the dog dry isn’t just a measure for comfort, but also for health and safety. Getting wet can cause rashes if the dog isn’t dried properly after, and it can also produce unpleasant odors and general discomfort. A waterproof dog raincoat jacket might not completely protect your pooch from all of this, but it is a big step in the right direction. Plus, the right doggy raincoat will make them the coolest pup in the neighborhood, and who are we as owners to deny our dogs this? There is a wide range of options out there when it comes to rain gear for dogs so that you can find the product that best suits your needs and personality, as well as those of your dog. Go with a more classic option where function comes before design or pick a product that reflects your excellent fashion sense, yet also keeps your dog dry and comfortable. When starting to look around for the perfect raincoat, you will quickly realize that the options are close to endless and that there is a large variety of models available. You can choose one that covers your whole dog, including its tail, or a more athletic version that hugs tightly around your pup’s back and torso. Usually, the more they cover, the bulkier they are, and the ones with the best coverage aren’t always the best options for dogs that like to run around and play. Before picking what pet product to get you therefore what to think a bit about what your pet dog likes to do when outside in the rain and choose with whatever answer you come up with in mind. A dog that isn’t too comfortable with rain and that just wants to go out and pee might be happy with a raincoat that covers everything and that has long sides, such as the NACOCO Dog Rain Poncho! A very active dog, on the other hand, might need something less obstructing so that he or she can run and play the way they would on a sunny day and when not wearing a raincoat jacket. If they don’t seem to mind the rain too much – take advantage of it! The Vizpet High Visibility jacket is an excellent example model, as it hugs the body in a unique way; providing relief from the rain yet being lightweight and unnoticeable enough for a dog to go wild and have fun. What model will work best for your dog depends entirely on his or her personality, and on what he/she prefers to do on rainy days? The more you know your dog, the better of a choice you can make for what raincoat jacket to invest in. Quality rain wear for dogs should be made out of a material that is truly waterproof, or the rain will quickly defeat its purpose; weighing it down and making your dog uncomfortable. Nylon is known for keeping water out, and it is the material that is most commonly used in raincoats for humans. Keep an eye out for Nylon if you want a dog raincoat that truly keeps the water away, even though some Polyester dog clothes are also good enough to keep the dog dry for a shorter walk. If your dog will be using the raincoat jacket for walks on trafficked roads – make sure it has reflective strip features and if possible also bright colors for increased visibility at night. It is difficult for drivers to spot a dog that walks along the side of the road, even with lights on, and reflective strip features and details give them an opportunity to spot them (and you) already from far away. Remember that rain can decrease overall visibility, so do what you can to make sure you are safe when taking your furry best friend for a walk. When it comes to the design; such as print and color, it is really just a question of personal preferences. Perhaps you prefer a more discrete color to go with the somewhat gloomy features of a rainy day – something that blends in – or perhaps you are one of those who wants to add a bit of color and fun to a day that might otherwise appear somewhat sad? There is something for everyone, and you can usually find a pet product with your favorite color, or perhaps one with print? The RC Pet rain coat listed above comes in the biggest variety of colors and prints that we have seen so far, and regardless of your preferences – you will surely find one (or several) that you like. When measuring your dog, you usually measure from the neck and all the way back to the beginning of the tail, as well as around the rib cage (depending on the raincoat model). This is easily done with a measuring tape, but if you don’t have one lying around – you can always be a bit creative by using paper with known dimensions (check the packaging) or a string of some sort. Don’t trust the breed recommendations on the dog clothes as every dog is different, and you never really know if a raincoat will fit properly unless you measure. Also, make sure you don’t rely on old measurements, since dogs might gain or lose weight without you realizing, so always measure right before ordering. Most raincoat models seem to use Velcro strips for easy use, and these models are almost always put over the dog’s head first, and then secured with a Velcro strap around the belly. Other models use quick-release buckles, which is great for active pups since it can’t open on its own even if they run and jump around. Both of these models tend to work in the same way, and they are fast and easy to take off and put on. Then we have a few where the raincoat closes with a zipper, a button or both, which generally take a bit longer to put on and take off and might be a bit difficult to use on dogs with long hair (that could get stuck in the zipper or buttons). If you know that you don’t usually have a lot of time to prepare for a walk in the rain – pick one that closes with Velcro or with a buckle. Today, most doggy raincoats come in all sizes, so that you can base your decision on the model you like the best, rather than to have to look for rain gear made especially for small, medium or large dogs. Keep in mind that a small dog raincoat needs to be light-weight and comfortable, or they will hate wearing it. You know how small dogs can be…! Don’t wait until it is already raining to get a raincoat – but instead try to prepare well ahead of time so that you can enjoy those rainy days with your dog. Some dogs hate water and might not be up for long walks despite a comfortable rain jacket, but others will, and even for those who want a raincoat will still be beneficial for quick ventures outside to pee. As an additional plus – the right raincoat can make your furry bestie look adorable, and what pet parent does not have a weak spot for dressing up their pup? If you measure your dog and find that he or she falls right in between of two sizes – always pick the bigger size. It is better to have the raincoat be a little bigger than needed than for it to be too tight as that could restrict mobility. Dogs get cold just like humans do, and might need an extra sweater or t-shirt under their raincoat on chilly days (usually depending on how much fur they have). Read more about it here.